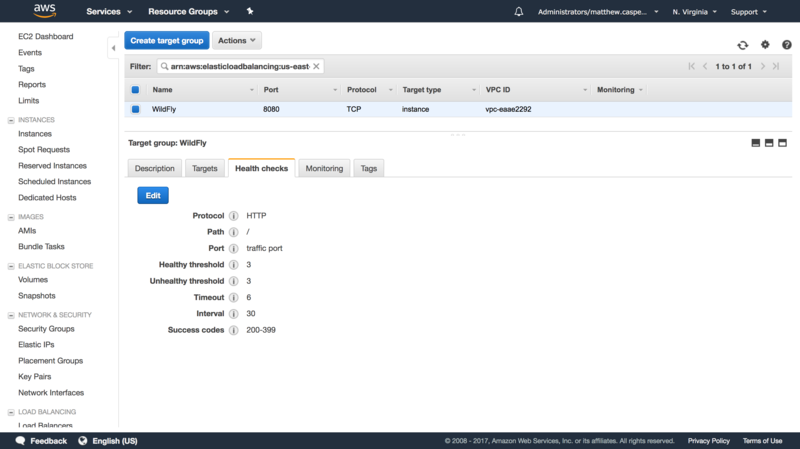 In the previous blog post we looked at how WildFly domains could be configured in an AWS environment with no fixed IP addresses or network broadcasts by centralizing configuration settings in an S3 bucket. 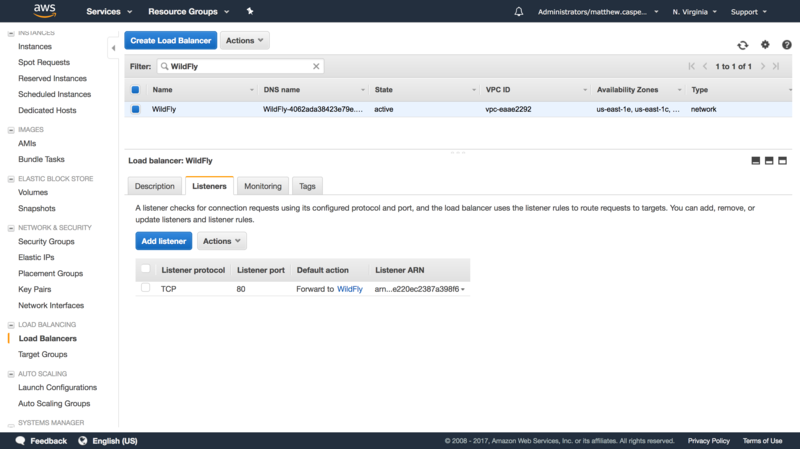 In this blog post, we'll take this configuration one step further by configuring a cluster of WildFly instances in AWS. Before we start configuring a cluster, it is worth spending some time discussing the difference between a domain and a cluster. A domain is made up of a domain controller and one or more domain slaves. The domain controller will distribute settings and applications to the domain slaves, as well as providing a way to start, stop and restart slave instances. A domain is simply a management tool. You do not get any additional functionality, beyond simplified management, because instances are part of domain. In fact you can replace a domain using tools like the JBoss Operations Network (JON). The term cluster can be a little ambiguous, so for the purpose of this blog post a cluster means two or more WildFly instances that share Servlet session state. Sharing this state means that server side web applications can be provided by any node in the cluster, and if one of those nodes goes down, requests will be fulfilled by another node that has a copy of the session state. Although in theory a cluster allows for any node to respond to a request for a stateful web application, in practice you'll usually implement sticky sessions to direct traffic from a session to a single server (as long as it is available). The Infinispan documentation talks about the performance benefits of using sticky sessions. A domain can be used to configure slave instances as part of a cluster, or a domain can be comprised of multiple independent nodes that do not form a cluster. Likewise multiple standalone instances of WildFly can be configured to form a cluster. So while both a domain and a cluster are groups of WildFly instances coordinated in some way, the two terms refer to different things. Although we don't need a domain to configure a cluster, a domain is a convenient way to distribute common settings to multiple WildFly slaves, so we will utilize a domain to build our cluster. We'll build on the work already done as part of the previous blog post to build a WildFly domain. Extending the domain to support a cluster requires a number of steps. When building the domain we used a shared S3 bucket to facilitate the discovery of the domain controller. In a similar fashion we will use a shared database to facilitate the discovery of cluster nodes. 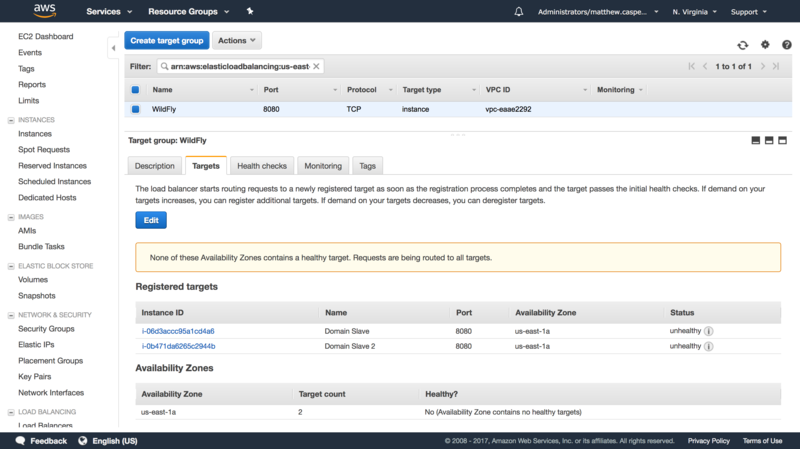 Since we are deploying our WildFly instances in AWS, we'll use an Aurora database as our central point of cluster configuration. Aurora is MySQL compatible, which means we'll configure WildFly as if it is communicating with a MySQL database. Using the MySQL client tools, log into the RDS instance and create a schema called jgroups. This is done with the command create database jgroups;. On each WildFly slave we need to add a module that contains the MySQL drivers. A module is just a collection of JAR files and some metadata WildFly can use to load them. Start by creating a directory called modules/system/layers/base/com/mysql/driver/main. Inside this directory create a file called module.xml with the following contents. Then save the MySQL driver JAR file mysql-connector-java-5.1.44.jar to the directory. The RDS instance will be accessed via a datasource. This is defined in the domain/confguration/domain.xml file under the ha profile. All the children of the <profile name="ha"> element make up the ha profile. To define our datasource we need both a <datasource> element (to define the database connection) and a <driver> element (to define the MySQL JDBC driver details). In this case we are pointing the datasource to a schema called jgroups, and connecting with a user called jgroups (although these two values don't need to be the same). JGroups is the library used by WildFly to connect members of a cluster. By default JGroups is configured to use UDP and multicasting, but neither UDP nor multicasting are supported by Amazon. So instead we need to configure WildFly to use TCP and make use of the central database as a way of discovering peers. In the jgroups subsystem we will be switching to the tcp stack by changing the stack attribute on the <channel> element. We then need to replace the MPING protocol with JDBC_PING. This is what the complete stack now looks like. In order to take advantage of our changes to the ha profile, the slave instances need to be configured to use it. This is configured in the <server-groups> element. Change the main-server-group to use the ha profile. 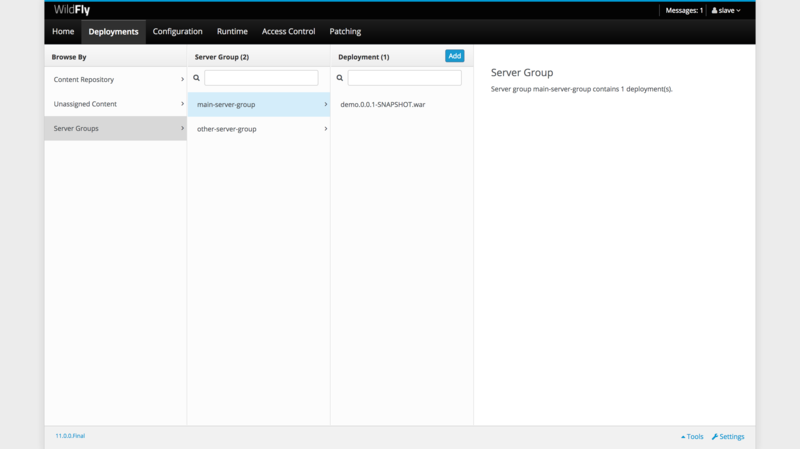 Also change the server group to use the full-ha-scokets socket binding group. The complete <server-groups> element now looks like this. The full-ha-sockets socket binding group uses port 7600 for JGroups, so this port will need to be opened on our firewall. In order to register the correct address in the database, the WildFly slave instances need to bind the private interface to the IP address of the external NIC. This is done by passing the -bprivate=<ip address> argument to domain.sh. And because these slave instances will need to serve traffic to the outside world, we also need to bind the public interface to the IP address of the external NIC. This is done by passing the -b=<ip address> argument to domain.sh. For example, this command starts a slave on an EC2 instance with the IP address of 172.30.0.88. We are not binding to the public IP address of the EC2 instance (if it even has a public IP address). A load balancer will take public internet traffic and direct it to the local subnet IP addresses that WildFly has been bound to. At this point we now have a domain that configures a cluster. The WildFly slave instances will take their configuration from the domain controller (discovered via a shared S3 bucket), and that configuration includes a JGroups stack that will allow a cluster to be formed (by querying a shared database). In order to actually take advantage of the cluster, we need a centralized load balancer to distribute requests between the slaves. This is important because the cookie that represents the session will be bound to the address of the load balancer and not the address of any individual node. In this way a single session, represented by a single cookie, is shared amongst members of the cluster. AWS provides a load balancer that will do the job. Our load balancer will target the WildFly target group. This target group has two WildFly slave instances, and will direct traffic to port 8080 (the default HTTP port for WildFly). We'll just use the default WildFly welcome page as a the health check. In order to take advantaged of a replication session state, our Java web app needs to be marked as distributable. This is done in the web.xml file with the <distributable/> element. This example web app has been configured to be distributable. This example app maintains a page count in the session storage, and we can use this value to ensure that our session data is in fact replicated across the cluster. We'll build this app and deploy it across the domain. With the app deployed and our load balancer in place, we can open the app. Each time we refresh the page, the Page count will increase. This is done by incrementing a value in the session storage, which is the storage that our cluster is replicating. If we look at the JSESSIONID cookie, we can see that it is bound to the load balancer domain. This is important, because this cookie is how we track our session, and because of the way browsers work this cookie will only be sent to the domain that created it. So by hiding the WildFly servers behind a load balancer, the browser is unaware of which instance of the cluster is responding to the request. However if we look closely at the value of the cookie, we can see the IP address of the slave instance that initiated the session: 172.30.0.88. This value only represents the cluster member that started the session, and does not change if different cluster members respond to subsequent requests. We can use this information to shutdown the slave that is hosting our session, forcing traffic onto the second slave. Leaking the ip address of the slave can be avoided by defining the name attribute of the <host> element in the host-slave.xml file. With the cluster node that initiated the session now shutdown, all traffic moves to another member of the cluster. But the page count will continue to climb from its previous value, and not reset to 1, because the replicated session means the end user can continue on like nothing happened. Once a distributable app has been deployed, JGroups will start registering information in the shared database. Using the MySQL client we can log back int the database and list the tables in out jgroups schema with the show tables; command. Here we ca see that the JGROUPSPING table has been created. In this post we have seen how to configure a domain to create a cluster, and how to allow that cluster to identify peers via a shared database. This cluster is then exposed via an AWS load balancer. We've then deployed a distributable web app to the domain, and forced traffic onto a new cluster node by shutting down the instance that created the original session.